Happy New Year to all my wonderful readers!! It feels like only yesterday since I was writing my Happy New Year post for 2016 and it is 2017 already! Where has the time gone? And wow, what a year it has been. Whilst I’ve only been blogging for 19 months or so, and still a fairly new blogger by most people’s standards, I feel so much more established than this time last year and I have learnt so much over the course of the last year. My blog has grown and developed at an incredible rate and I have achieved all sorts of milestones I certainly didn’t expect to reach in 2016!! In my New Year’s Day post last year I set myself some blogging goals and I thought it would be fun to review them in this year’s post, before setting some new goals for 2017!!! The Foodies100 chart is like Top of the Pops for bloggers. The lovely team at Foodies100 rank all the food blogs in the UK based on metrics such as monthly page views, social media activity and Google ranking. Back in January 2016, you found me a little sad that I had just narrowly missed out on getting into the Top 500 (out of 5000 or so bloggers in the UK!!) and my goal for 2016 was to get into the Top 500 (and secretly I was hoping for the Top 250). Well, I well and truly smashed that – I am currently ranked number 140 and my highest score, which was last month, was 125!! Well, I can definitely put a great big tick by this one!! In the early part of 2016 I bought my lovely Canon DSLR camera and 50mm lens, plus several photography books (including Food Photography by Nicole S. Young and Plate to Pixel by Helene Dijardin) and got practising. Then later in the year I went on a food photography course hosted by the lovely Emily Quinton of Makelight Studios. Whilst I am by no means a professional photographer, I feel like I have made an enormous improvement over the last few months. If you want to compare, check out my Sweet Potato Chilli, taken in January 2016 versus my Turkey and Sweet Potato Tacos, taken in December 2016. These two posts show just how far I’ve come over the last year. If you want to know more about what I’ve learnt about food photography since starting this blog, check out this post. Another tick! Foodgawker is a photosharing website and the editors are quite fussy about what they will accept, so getting accepted onto Foodgawker is a real achievement. This one took me until May, but I had a proper little dance round the kitchen when I realised I had made it. My first acceptance onto Foodgawker was this delicious slow cooked beef chilli. And now I’ve got to the point where most of my submissions get accepted onto Foodgawker and Tastespotting, which is a real milestone. And entirely linked to the hard work I have put into my photography this year, I’m sure. 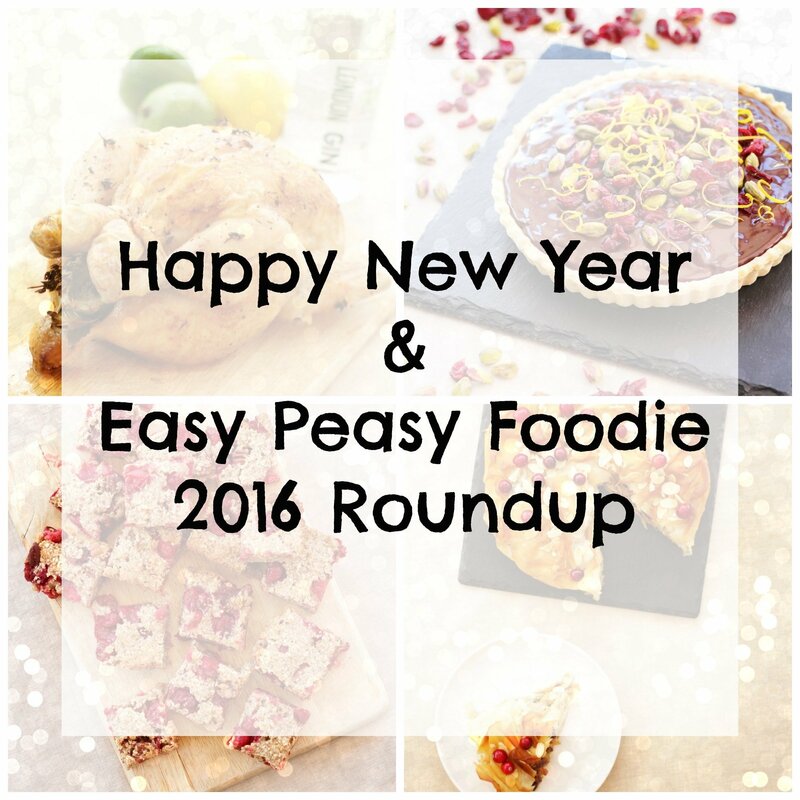 In 2015 all my posts were recipe posts and in 2016 I wanted to branch out a bit and do some reviews. 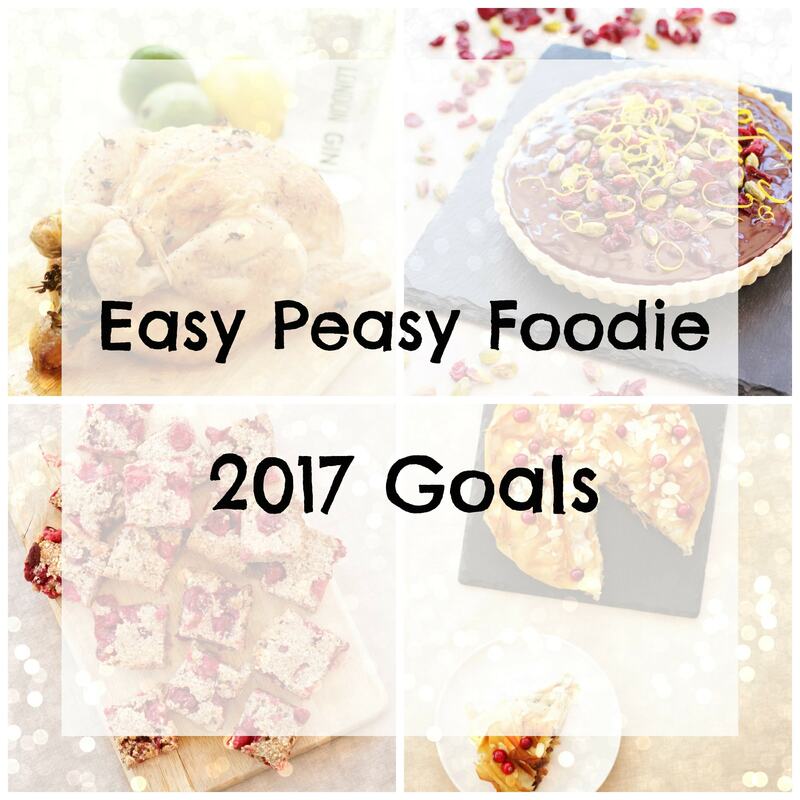 Partly to make Easy Peasy Foodie more interesting and partly to rank better on search engines, but also because I wanted to showcase what I could do in the hope of attracting some brands to work with…more about that later. Well, I achieved this one too. 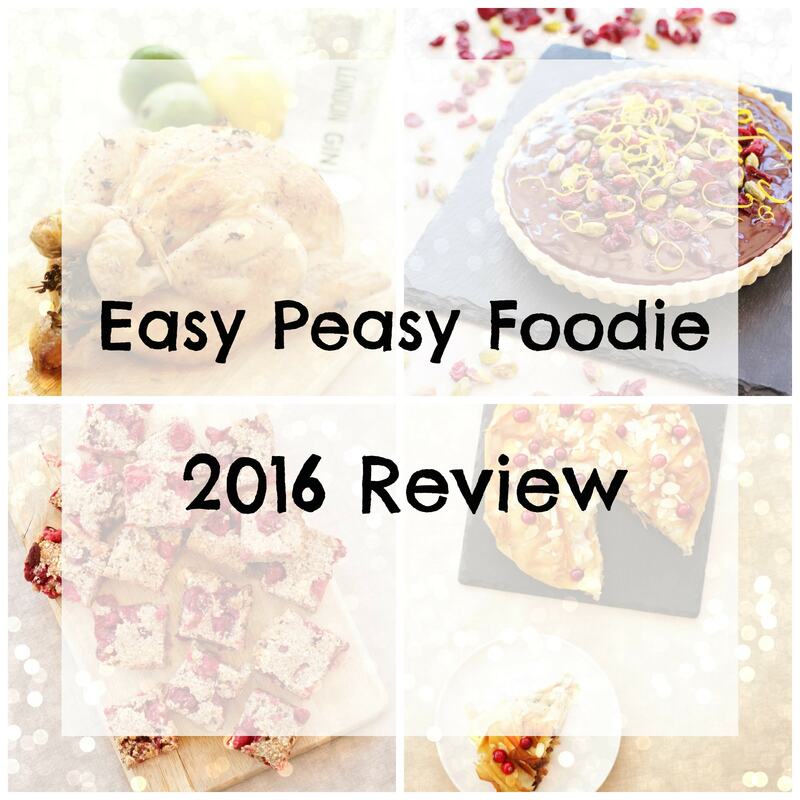 I have done quite a few reviews in 2016 ranging from cookbooks to recipe boxes. Particular highlights included my review of The Sirtfood Diet and my review of The Spicery Recipe Kits. Not only did I throw in some review posts but I also did some roundup posts and blogging tips posts too. OK, this one I did not do, but for a very good reason. I was considering launching my own linky in September, but just as I was starting to think of it, I was contacted by the lovely Kirsty of Hijacked by Twins, who asked if I’d like to help host the Cook Blog Share linky alongside herself and Mandy from Sneaky Veg. I positively jumped at the chance! And haven’t regretted it for a second. I have so enjoyed hosting #CookBlogShare, which is easily my favourite linky. (Yeah, OK, I am a bit biased). The thing I love most about it is the sense of community and camaraderie we have. If you are a blogger and would like to join in with #CookBlogShare, come on over and check out the current linky, or check out The CookBlogShare Facebook Page. Well, I did half of this one. I spent the first few weeks of 2016 completely overhauling my blog – improving my About Me page, creating a Work With Me page and generally tidying things up and making my site look more professional. I also made it possible to subscribe to my blog and get sent my posts via email automatically. (What do you mean you haven’t subscribed? Do it now!! Check out the subscribe button in the sidebar on the right 🙂 ) But I didn’t ever get around to creating a proper newsletter – definitely something to work on in 2017. Well this one’s a yes and a no. I did get more followers on social media, but not as many as I was hoping for. I did spend some time working on my social media profiles and dramatically improved the look of them, as well as rewriting my profiles (Do go and take a look, I’m on Twitter, Facebook, Instagram, Google + and Pinterest, and do please feel free to follow me if you don’t already!! ), but this is definitely another one I need to work on for 2017. I didn’t really set myself a goal for page views last year and I am not sure why, (I’m usually quite a goal oriented person – can you tell??? ), but I have been delighted by the month on month growth my blog has shown this year. When I started 2016 I was getting around 1,500 page views per month and I’m currently running at around 15,000!! That’s ten times what I was getting this time last year!! So, just let’s say I get the same increase, that would be 150,000 page views per month by the end of this year. I’ve no idea whether that’s achievable but I intend on giving it a good go!! One of the most exciting things about this year has been starting to work with brands. I have worked with some brilliant brands this year: Mr Kipling, Flora, British Turkey, Grana Padano & Prosciutto di San Daniele, the River Cottage and the Tasty Easy Lamb Campaign to name but a few. I’m really hoping to do lots more of this in 2017. In fact I already have something very exciting lined up….more about that very soon!! Along with collaborating with brands on reviews and recipes, I have also started hosting competitions this year, which I have really enjoyed. The first one was back in April with Mr Kipling, and more recently I have hosted a lovely competition to win a hamper of Grana Padano cheese and Prosciutto di San Daniele ham. I’m hoping to do lots more of these in 2017!! Back in October I got the chance to do a food writing course and meet one of my foodie heroes Karen Barnes, the Editor of ‘delicious.’ magazine. I’ve been regularly getting ‘delicious.’ magazine since about 2010 and so it was such a treat for me to meet Karen – though slightly scary having to read out my writing to her! The whole weekend was huge highlight of the year for me. Amazing food and accommodation, courtesy of the lovely Lisa Osman and All Hallows Farmhouse and amazing teaching from Karen. Plus wonderful company. I rather wish there was a part 2! One of the goals for 2017 that I didn’t write down, but fully intended on doing, was to start writing some food blogging tips. I did a whole bunch of these to celebrate my Blogiversary on topics such as How to start a food blog and 10 things I have learnt from my first year of blogging. I had fully intended on making that a more regular feature but singularly failed, so I will be redoubling my efforts in 2017! I couldn’t finish this section without mentioning my award! Yes 2016 was the year I won my first blogging award. I received this for my Turkey Tikka Masala Meatballs recipe, which won the Best Blogger Recipe category at the British Turkey Awards. I got to go down to a fabulously glitzy awards ceremony in London and was given my award by Hugh Dennis. It was all rather surreal, but totally wonderful. This is a huge goal for me and it doesn’t feel too far off, now. But obviously, the further up the chart you climb, the harder it becomes to climb any higher. I’m not resting on my laurels and will continue to work hard in the hope of getting there soon. Being in the Top 100 is particularly exciting as you are listed on the Foodies 100 site, so I have all my fingers and toes crossed for that one! No need to get a better camera this year, but I certainly want to continue to improve in this area. As my photography improves, so does my eye for a good photograph and I can see there is still plenty of room for improvement!! Whilst I don’t need a better camera, my Canon 1200D is definitely good enough for the moment, I do have my eye on some extra kit. I’d like a tripod and some new backgrounds for starters. I also plan to reread my photography books and maybe do another photography course. I quite fancy the Makelight Food Photography Level 2 Course, or the All Hallows Food Photography Course. One thing I do find very exciting is seeing my progress over the last year and realising just how good my photos could be if I make the same level of progress this year. Not sure if that is possible, but I am definitely going to try!! Well, I had this goal last year and I plan to work even harder at it this year. I would like to see real improvement in this area. I plan to read more about it, maybe do a couple of courses too. Do let me know if there are any books, blog posts or courses that you’d recommend. I have learnt so much this year from other bloggers and, as much as anything, I really want to give something back. I absolutely loved doing my blogiversary series back in May and I really want to do more posts like that. I have learnt loads in these last 19 months or so and I really want to share with other bloggers what I have learnt. I have tons of ideas buzzing round my head, but if there is anything you’d like me to share, please do let me know in the comments below. I was so delighted with my beautifully redesigned site back in Jan/Feb last year, but already it’s not quite looking how I want it to. My plan is to give it another makeover in the early part of 2017 so watch this space! I am planning to take the plunge and get a premium theme for Easy Peasy Foodie this time. A premium theme (which is like the design template) should make my website look a whole lot more professional and make it better to access on mobile phones and tablets too. Along with getting refreshing my website design, I also want to get my logo redesigned. The logo you see above, I designed myself over a year ago and, though it’s not awful, it doesn’t look as professional as I want it to, so I am going to see about getting a professional designer on the case. Do let me know if you know anyone who is good (and not to expensive!). This was in my plans last year, but rather fell off the do list. My first priority is to make it easier for my readers to subscribe to my posts. (If you don’t subscribe already just type your e-mail address into the Subscribe section on the right) I’d like to create more places to subscribe – at the moment it’s just on the right. And a landing page so I can link directly to a place to subscribe, rather than just telling people to go and look for it somewhere on the right hand side (actually it’s down below if you are on a mobile or tablet). But I also want to start sending out a regular monthly newsletter, letting my subscribers know what I’ve been up to, highlighting any older posts which might be relevant and maybe even including special subscriber only benefits – e.g. exclusive subscriber competitions. I’ve done some amazing collaborations in 2016, but I’d really like to do lots more in 2017! So if you are a brand or a PR and would like to collaborate with me in 2017 do pop over to my Work with Me page to find out more, or drop me a line if you want to be sent my media pack. Phew I think I’ve got my work cut out in 2017, don’t you? But one thing I’ve learnt from 2016 is, I might have to work hard, but I will have so much fun on the way and it will be so worth it come the end of the year when I reflect back! Finally, I just want to sign off by saying a great big thank you to all of you fabulous people – I couldn’t have achieved so much without your support. You really are wonderful. Thank you so much for all your kind comments, retweets, shares, likes and especially the lovely photos you have sent me when you make my recipes – this in particular makes me SO HAPPY!! I do love hearing from you, always, so do please drop me a line if you make one of my recipes, have a question or an idea, or just want to say hi. Contact me either by leaving a comment on the appropriate blog post or via Twitter, Facebook, or Instagram. Hope your 2017 is full wonderfulness!! This post contains affiliate links. If you click on a link and subsequently go on to make a purchase, I may get a small commission – thank you in advance! For more information about affliliate links, pleasure read my Disclosure Page. Wow! You’ve achieved so much this year Eb. I am sure you will continue to do fantastically well. You have a lovely blog with some delicious recipes. Very talented lady you are!!! You’ve had a great year and I’ve really appreciated seeing your recipes in Meat Free Mondays so often. Your photography is always beautiful and a pleasure to feature. Happy New Year and I hope in 2017 you exceed your goals and have a happy healthy year.